This is the perfect aromatherapy reference guide for learning about using essential oils in the home and garden! Each Decoder wheel provides a quick and easy reference to aromatherapy by simply turning one of the four dials. 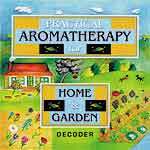 The Practical Aromatherapy Decoder for Home and Garden wheel includes information about the uses of essential oils around the house and in the garden. Some of the categories included are: cleaning and disinfecting, repelling insects and pests, getting rid of mold on plants, deodorizing, and creating scents for the home. Approximately 6" x 6" x 1/4".